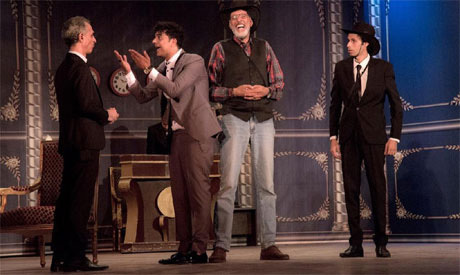 The head of the Egyptian Artistic Theatre House Ismael Mokhtar announced this week that comedy show Abou Kabsoula will extend its run for 15 more nights. This the sixth time the show has been extended, after it gained widespread success following its premiere during Eid Al-Adha. The comedy show, starring promising young comedian Mostafa Abo-Sriea and directed by Mohamed Morsi, is on at the Bayram El-Tunisi theatre in Alexandria. A couple of VIPs have seen the play, including Minister of Culture Enas Abdel-Dayem and the manager of the Creativity Centre Khaled Galal. The play is about a series of events that happen to an inventor after he comes up with a capsule that gets rid of hunger. Abou-Sriea, who caught the public’s attention after starring in a number of recent TV shows and films, also wrote the lyrics of the play’s songs, which were composed by Karim Arafa and arranged by Ayman El-Turki. The crew is mainly from an Alexandrian theatre group. Hassan Abdel-Fattah, Alaa Zeinhom, and Nourin Karom share the stage.